OES is offering their annual Spring Workshop in various locations around the state. Participants should print out and bring materials as handouts will not be available at the workshop. Please visit Spring Workshop 2018 to register and access the presentation handouts. 1. Please download the most recent Private School Documents to access the current In District and Out of District Private School Letters, Consultation Documentation, and Equitable Services Worksheet. 2. All districts are required to send letters to Private Schools within their district boundaries as well as outside of their district up to 25 miles away from their district boundaries. Districts should be sure to conduct a geographical search using EEM to find all Private School entities 25 miles outside of their district boundaries. 3. Districts will be required to upload a sample of their in district and out of district letters into GEMS/MARS. Information on how to do this will be forthcoming from the State Ombudsman, Teresa Nugent. Districts with participating Private Schools will be required to upload their completed Consultation Documentation into GEMS/MARS. ​For more information, please visit the State Ombudsman Webpage. Michigan is Set to be Top 10 in 10! 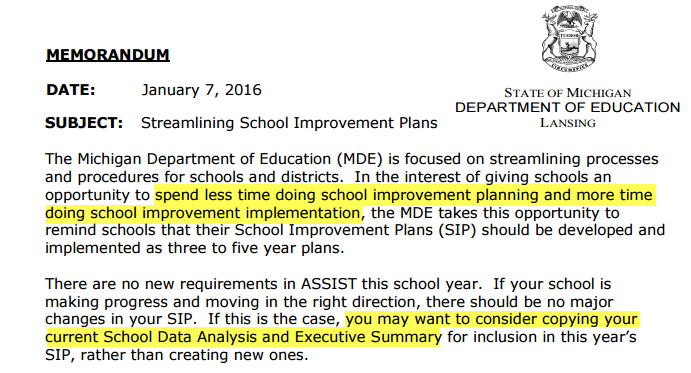 MDE has announced local districts should STREAMLINE the School Improvement Process, see the official memo dated January, 2016: MDE Calls for Streamlining ... with the recommendation to COPY diagnostics, learn how on the ASSIST Support Page. Key Due Dates include: SSR or Interim-SA by March 17 and DSR or District Interim-SA by April 21 (support page); Annual Ed Report is due in March 2017. School Improvement Plan and components (i.e. SDA) should be done by June 1, but mandated by Sept. 1 (SIP page); District Improvement Plan, Title I School Selection, Consolidated Application and Program Evaluation Tool by June 30.